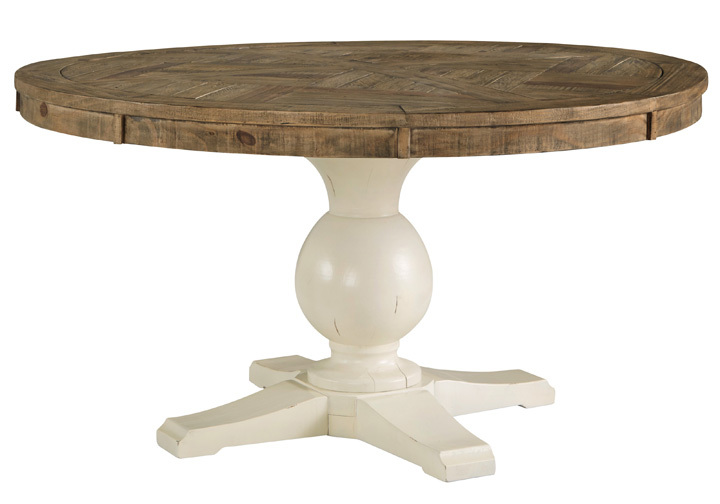 Grindleburg round dining set is a well-made country cottage inspired piece. 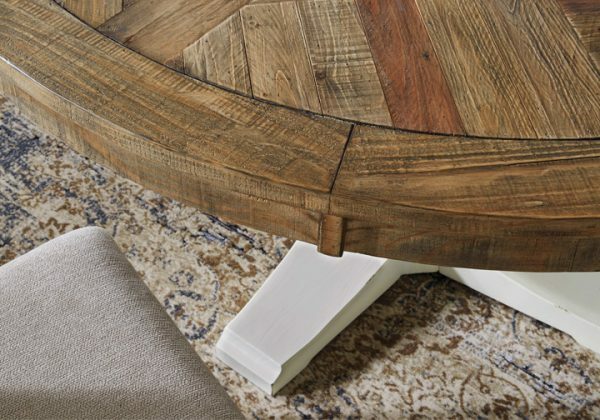 Crafted with reclaimed pine wood, it pays homage to natural materials. Farmhouse-style base is a substantial foundation. Natural finish grounds the space with earthy élan. 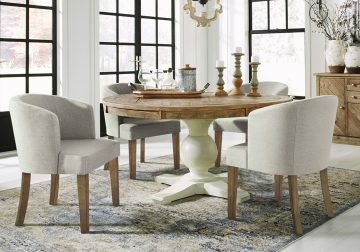 Wraparound barrel seating and fade-resistant Nuvella® performance fabric ensures all-around comfort during your meal that lasts. With room for four people, plenty of farm to table dinners are in order. 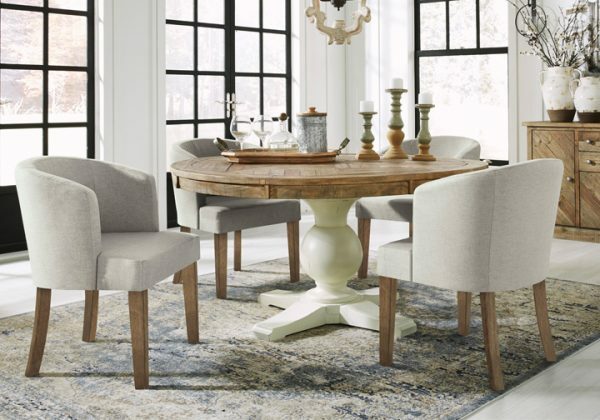 *The 5 piece dining set consists of one dining table and four chairs. Made with Pine solids in a two-toned finish application. D754-50B table base and D754-01 chair have a textured white rub through finish. D754-125,-50T tables and -80 buffet are made with reclaimed pine solids in an trendy light grayish brown finish. D754-125 trestle dining table has a cross buck pedestal base and interesting inlay top with planked effect. Server has a chevron layup to coordinate with drawer and door storage. D754-01 chair has a broad rung ladder back design with light gray fabric cover or a stylish slip cover look with a linen like fabric. D754-02A chair is upholstered with a casual soft pillow-top seat cushion. Loosely tailored cover effect with a flange welt to accent the arms and back silhouette. Linen-like woven textured cover. D754-03A chair has wrap-around barrel seating for casual comfort. Loosely tailored cover effect featuring “Nuvella” performance fabric. 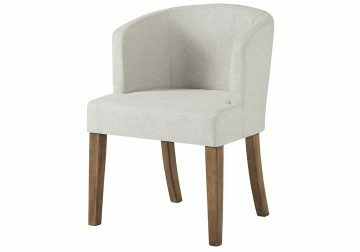 D754-01 side chair uses “Nuvella” performance fabric. D754-05 chair has a slat back design in an all-over light natural finish and seat cushion upholstered in a light tone performance fabric. D754-06A arm chair has a deconstructed design with exposed “framing” elements in a textured black finish. It is upholstered in a two-tone cover application with a linen look seat and back cushion and accented with a burlap back panel.